Most truth students know the Bible passage "Take no thought, saying, What shall we eat? or, What shall we drink? or, Wherewithal shall we be clothed? for your heavenly Father knoweth that ye have need of all these things. But seek ye first the kingdom of God, and his righteousness; and all these things shall be added unto you." Yet although many believe they sincerely seek the kingdom of God, they do not experience the added things. Why? 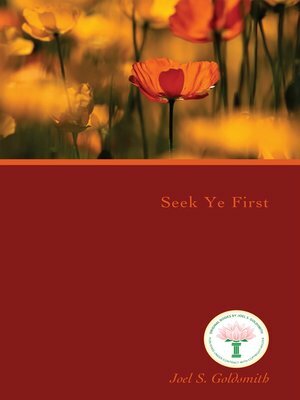 Joel Goldsmith's book Seek Ye First illumines the inner, true meaning of that familiar Bible passage in unique way that will elicit a resounding "A-ha!" in those who have struggled to understand it. Goldsmith says that we do not experience the fruitage of the biblical promise because we hold onto erroneous concepts of God and prayer. We pray to God for things or we try to attain them through mental work. Before we can experience the grace of the "added things," he says, we must first correct our concepts. Goldsmith proceeds to re-educate the reader on the nature of God and the nature of prayer as he masterfully goes through the spiritual principles and practices revealed in The Infinite Way. The author asserts, "God's grace can reach us only as we are attuned to the kingdom of God within." Emphasizing that meditation is the way to come into this spiritual attunement, he reveals the secret: we must not go into meditation for anything. We must not go to God for health, wealth, companionship, or a home. We must have no material motive because this is the almost insurmountable barrier to God-realization. We must seek only illumination, the experience of the Christ within. "Only when you can stop taking thought for your life, stop praying to a Santa-Claus-God with promises to be good if only He will deliver, will you attain." While this may seem very abstract at first, Goldsmith reminds us that what takes place in our inner world governs our outer world. After we have found that inner Grace and made our inner contact, we awake and find that all things have been added unto us, for the illumined mind is the substance of fulfillment at every level of our existence – even the most practical. Those who want to explore the depths of Goldsmith's mystical teaching will find Seek Ye First a trustworthy guide brimming with a wealth of wisdom from his inspired classes.